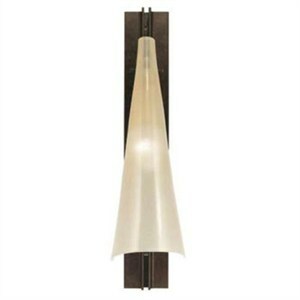 Wall light for diffused ambient illumination. Choose from hand-waxed rusty finish with sanded, blown, gold leaf glass or satin nickel with white opal blown glass diffuser. Fixture can be mounted with glass up or down. Dimensions 4.3"W X 16.5"H X 7.1"Extension. Uses 1 X 60W 120V E12 (candelabra base) xenon lamps (not included).